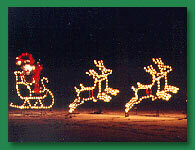 Many residents in the area know the holiday season has begun when they see the illumination of Sandy Point State Park. They have made driving through Anne Arundel Medical Centerâ€™s holiday light show â€œLights on the Bayâ€ at the park a family tradition for over 10 years. The â€œLights on the Bayâ€ event, which opens in November and runs through Jan 1., features a scenic drive along the shore of the Chesapeake Bay where more than 60 spectacular animated and stationary displays illuminate the roadway.